“Teret, Teret” – “A story, a story!” calls out the traditional story-teller from Ethiopia, to announce the start of a new story. “Yelam Beret. Yemeseret,” answer the excited children and youth in a half singing rhyme, which means “cowshed”, and “foundation or origin” (= stories that arise out of tradition). Thus begins a typical evening of Ethiopian story-telling tradition. This ageless tradition signifies a good time of togetherness, wherein the whole village discusses God and the world, their own identity and numerous other questions, that have occupied man since time immemorial. As the exciting narrative comes to an end, the story-teller finishes with the rhyme, “Teretayn Melesu, Afayn Bedabbo Abesu”, which means something like, “As a reward for my story, give me bread to eat.” Thereafter, someone or the other takes over the role of the story teller, and begins again with, “Teret, Teret…”, another exciting and informative story. The old Ethiopian stories and folk tales, which have been brought down from generations, are most popular amongst the children and the youth. These stories teach them about the history of their land, about the culture and wisdom, what should be done and what should not. They teach them about humour, as well as about the day to day difficulties. The children reflect over them, laugh and cry. But these stories are also important for the adults, because they pass on from generation to generation, the principles of life. And now allow me to narrate a story to you, the Ethiopian story of the origin of coffee. 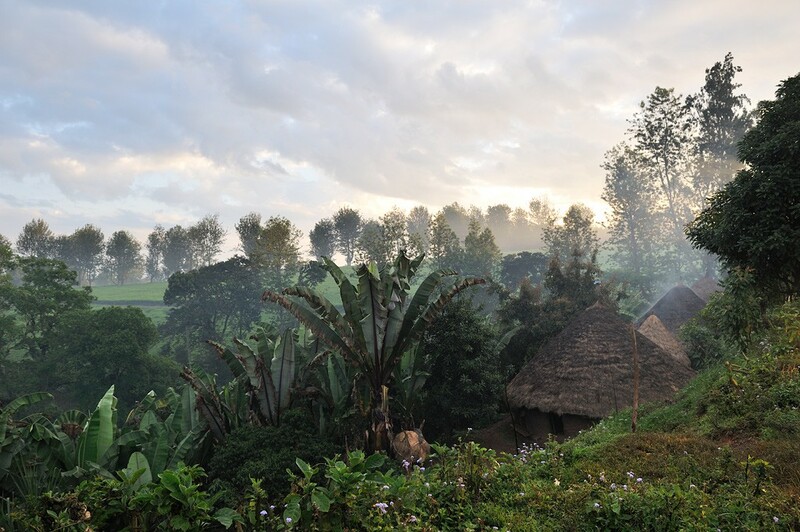 Once upon a time there lived in a small village in the Ethiopian region of Kaffa, a goatherd named Kaldi. Kaldi was a smart young lad, who worked hard from morning till late in the evening, so that he could support his parents financially. Kaldi and his goats would leave the house every day at sunrise. They would climb up a narrow path of a steep mountain till they reached the forest with fresh grass. In the forest there was clear spring water, lots of grass and fruits. That is why Kaldi and his goats liked to come here. Once, on the way home, as the day came slowly to an end, Kaldi heard a scream emanating from the forest, from one of his goats. “Oh no!”, he cried, “one goat is missing.” “The goat must have fallen prey to a hyena,” he thought worriedly. And so, he went into the forest to look for his goat. Deep into the forest, he found his lost goat, bouncing up and down. It was the first time that Kaldi had ever seen his otherwise peaceful goat so lively. Evidently, the goat had eaten some red berries from a tree. The other goats gathered around it, and began to imitate it. Just like the other goat, they too started jumping up and down. Encouraged by the lively goats, Kaldi also tasted the red berries. And what do you think happened then? Kaldi felt a freshness in his body and became as jovial as his goats. Kaldi plucked as many of the red berries as he could and went off in a good mood, with his leaping goats, down the dusty path towards his village. Back home, he went straight to the priest of the local monastery. However, he did not believe a word, and Kaldi was disappointed that the priest had not taken him seriously. Sad, he left the berries behind and went to his house with his goats. The monks of the monastery had, however, heard the conversation between Kaldi and the priest, and unable to let go off the subject, showed a great interest in the red berries. Finally, one of them took a few berries and chewed on them cautiously. Soon after, he felt a freshness in his body and he became just as lively, as Kaldi had narrated. That night in the monastery there should have been lengthy prayers through the night. Instead, that night, the priests who would have otherwise dozed off, lay wide awake, because they had all eaten the red berries. The priest asked one of the monks, what was going on. He told him that they all had tried the red berries. “That is a curse, this has to be the devil’s deal!” The priest threw the rest of the berries in the burning fire. Suddenly, a seductive fragrance emanated from the fumes of the fire into the air and everyone of them was enchanted by it, even the priest! The coffee growing in Ethiopia is 100% Arabica Coffee. Besides the Ethiopian Arabica Coffee is the Canephora Coffee (Robusta) which comes originally from the Congo, and the Liberica Coffee, from Liberia. These are the three typical kinds of coffee since the time coffee was discovered. 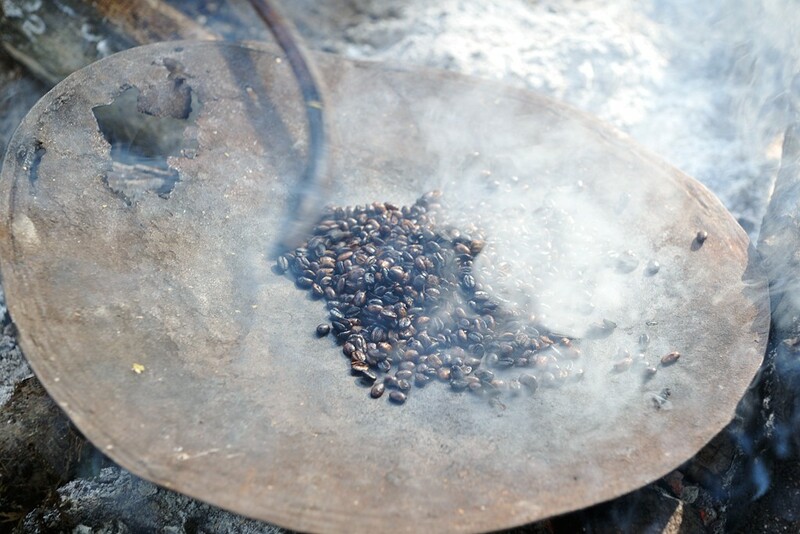 They all originate from Africa, but the Europeans in particular have spread the seeds of coffee across the entire world! And that is why today, coffee is grown in Middle and South America, Indonesia, Hawaii, Vietnam and since recently, even in China. 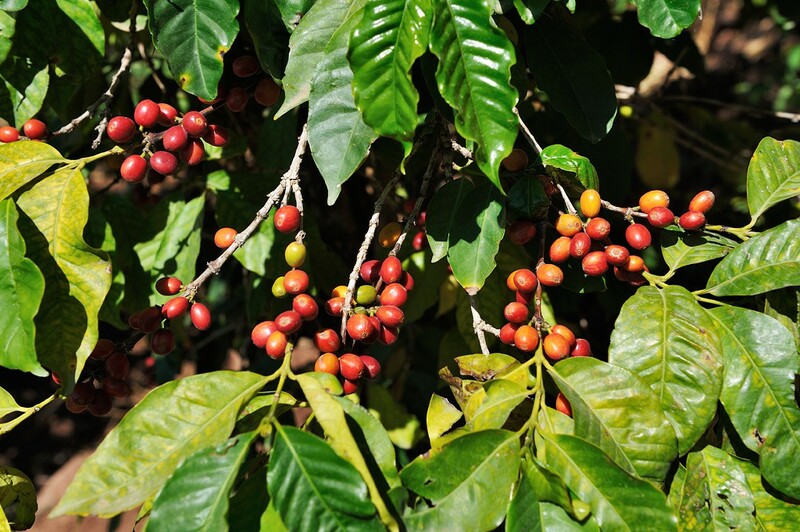 The Robusta and Liberica seeds, which are more resistant to diseases and parasites grow in areas with lower altitude than Arabica Coffee and have a higher productivity. 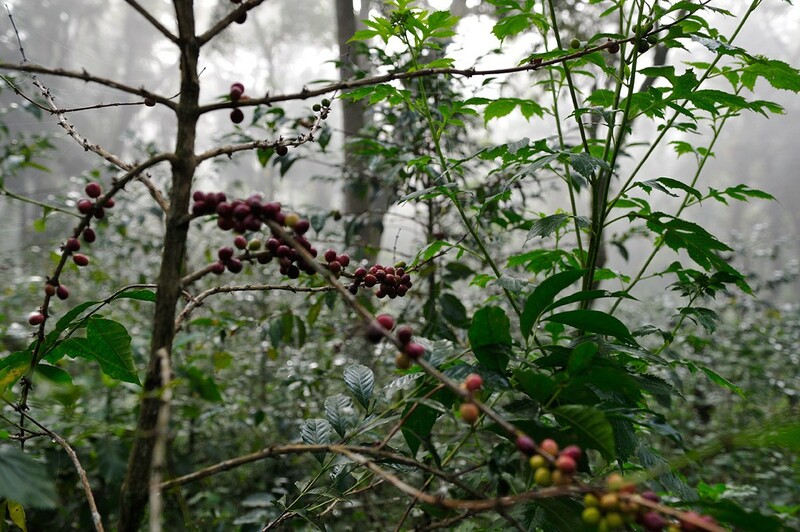 In the wild forests of South and Southwest Ethiopia the trees with wild coffee still grow in the same way man found them right at the beginning. 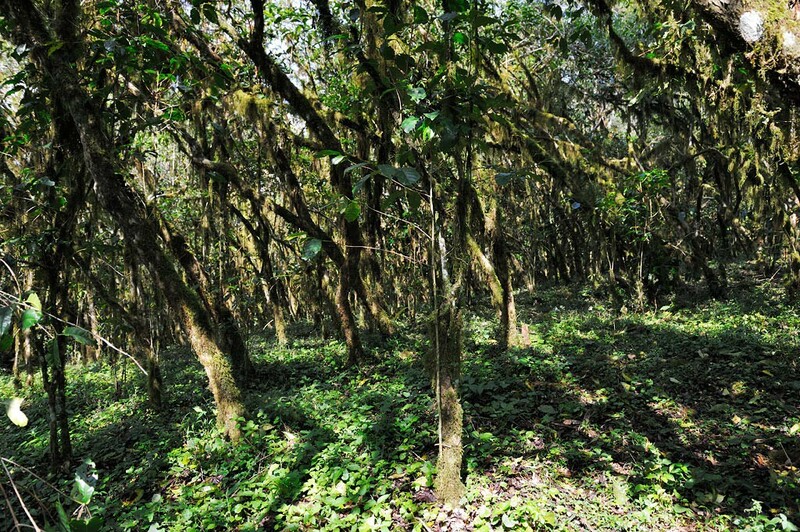 These trees are classified as the forefathers of the present day Arabica coffee plants, which is why locally, they are worshipped as mother trees of coffee and their ownership is passed on from generation to generation. Their average height is about 2m, some, however, are 6 – 8 m high. They grow in soil that is rich and leafy, which simultaneously allows the water to drain and yet retains moisture. The altitude is about 1,100 m – 2,100 m above see level, the annual rainfall is 1,500 mm – 2,500 mm. These cloud forests are one of the most bio-diverse regions of the world. There are more than 700 types of plants including medicinal plants, about 300 species of birds as well as antelopes, buffaloes, leopards and even lions living here. Arabica Coffee belongs to the one of the few globally traded products, that still exist in their homeland in the original form as wild plants. The research from the University of Addis Ababa shows that there are about 60 genetic strains of coffee . This genetic diversity presents itself increasingly as the main focus of public interest, because these originally, wild coffees have a huge cultural importance and a greater biological value. In 1970, the cross breeding of a gene of a coffee tree from the Ethiopian forest had solved a serious problem of infestation of fungus in coffee plantations in Latin America. This had helped to prevent a grave economic crisis. The value of the legacy of this wild coffee is thus incalculable. 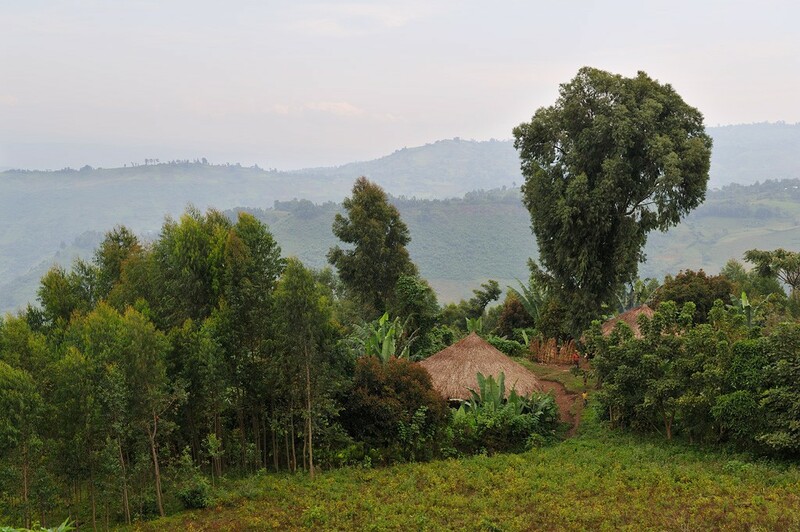 However, the Ethiopian forests, where the wild coffee grows, is becoming smaller with every passing year. 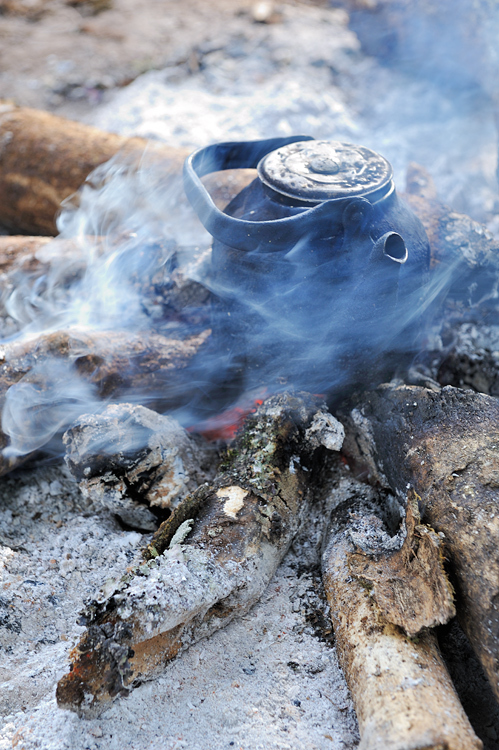 It is said that two thirds of the forests in Ethiopia are already lost and the worry is that the forests, which have been home to the wild Arabica Coffee are likely to become extinct some time or the other. To prevent this, in 2010, the „Naturschutzbund Deutschland“ (Nature and Biodiversity Conservation Union Germany – NABU) managed to get the wild coffee forests in the region of Kaffa the recognition of UNESCO Biosphere Reserve. This Biosphere Reserve, with 760,000 hectares, is about half the size of Schleswig-Holstein in Germany. A large part of it is covered with evergreen mountain cloud forests, which houses numerous types of rare animals and plants. 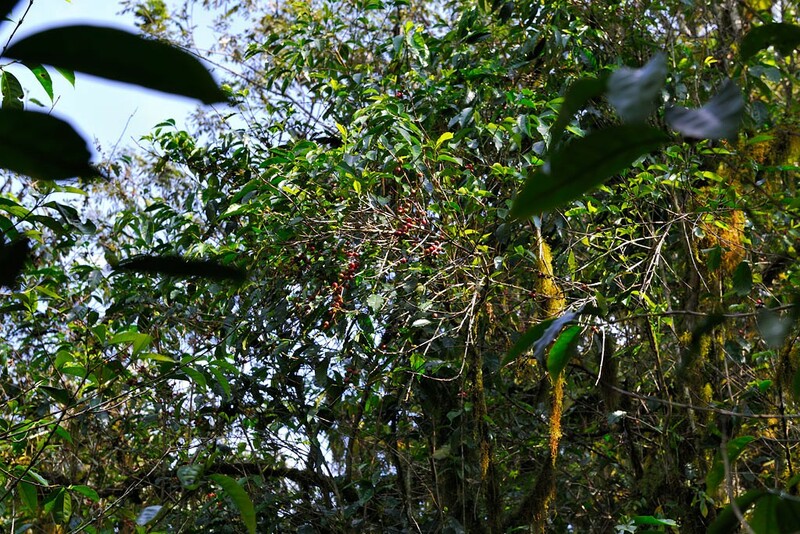 The forests are however, especially famous for the last reserves of Arabica Coffee.